So many teachers wind up disillusioned and discouraged by their students. I’ve said before that I was lucky, and this is one way. The longer I taught, the more I was impressed and moved by my students’ willingness to tackle big pictures and complicated topics. They weren’t just willing; they were eager, sometimes hauling their teacher along for the ride. In particular, I found that wonderful things could happen when I asked students to communicate the significance of lives distant from their own, particularly lives that are over. Stepping back: so far, this is the third in a series of posts. Two posts ago, I shared some resources for studying African-American history and the challenge of race in American culture. Last time, I focused on learning by writing, role-playing, or acting, particularly about the history of the Civil Rights Movement. 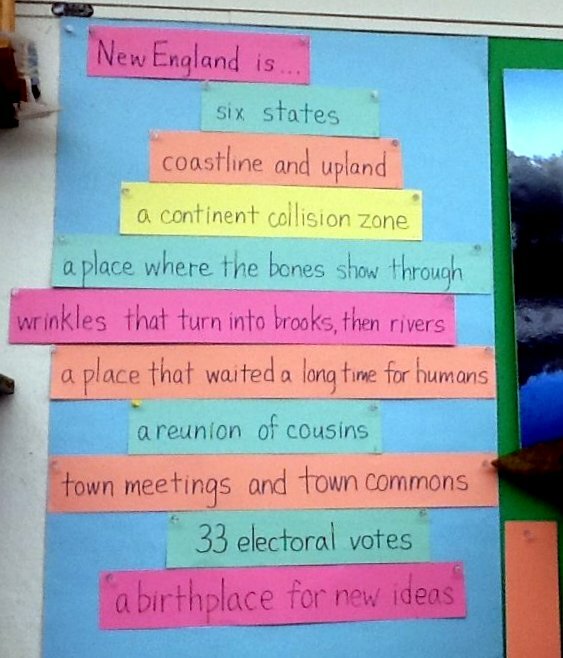 In this post, I want to focus on student presentations about individual change-makers, within a thematic study of New England. Then we looked at the routes and ways by which humans have arrived in this landscape, populating and changing it. Eventually, that led us to look at a New England tradition as powerful as the Red Sox: big new ideas about public life. When I designed this thematic unit, I felt that it made sense to look at the struggle to abolish slavery in the context of other efforts toward the inclusion of groups held apart, out on the periphery of decision making: women, people who don’t own property, Native American Indians, immigrants from beyond northern Europe. These were our essential questions for this part of the New England study: Who gets to make decisions? Who do we mean by “us”? How does that political reality impact our social and economic lives? How has all this changed over time, and how is it still changing? Teaching this unit in the fall of 2008, and then 2010 and 2012, I found–as I have so often–that time lines and maps are great tools for big picture thinking. But I also found that looking at individual stories could help kids travel through time and revise their understanding more successfully than anything else. We focused mostly on biographies of people never famous–or no longer famous. I wanted each student to be the authority in the room when he or she presented to the assembled class community, including parents and grandparents. I wanted them to sense the contributions of people we don’t often thank by name. From my work with the Alhambra Banquet curriculum, I had learned the value of asking students to choose from a menu of ideas or occupations, not a list of individual people. (They just didn’t know enough yet about the people.) I asked them to choose several categories, so I would have some flexibility in achieving a good match for every student. Once the match-ups were made, I had learned (again, from the Alhambra Banquet work) to provide a short, basic biography of just a few paragraphs. In 2008, our first year with this thematic study, Mary Brochu was working with me, and wrote many of the biographies in the initial set. Obviously, these short introductory biographies were particularly important for people about whom no biography had yet been written with a view to young readers. For most historical figures, a student who went looking could find more. We provided links to online sources, and talked in class about things to watch out for when using websites. I was thrilled to discover a gradual expansion of picture book and other accessible biographical resources, as Mary Brochu worked her usual wizardry turning up books I’d thought unlikely to exist. In any case, we encouraged all the students to research–and then share–not just the person but also the key concepts crucial to understanding the person’s story. What shape did slavery take in New England? 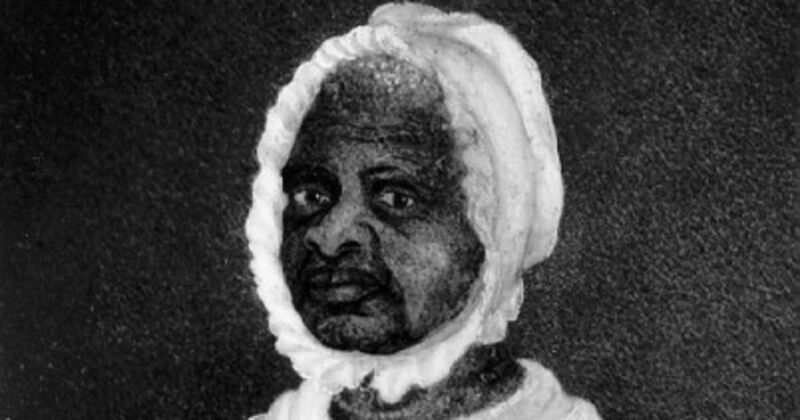 How did abolitionists communicate with their allies and adversaries? 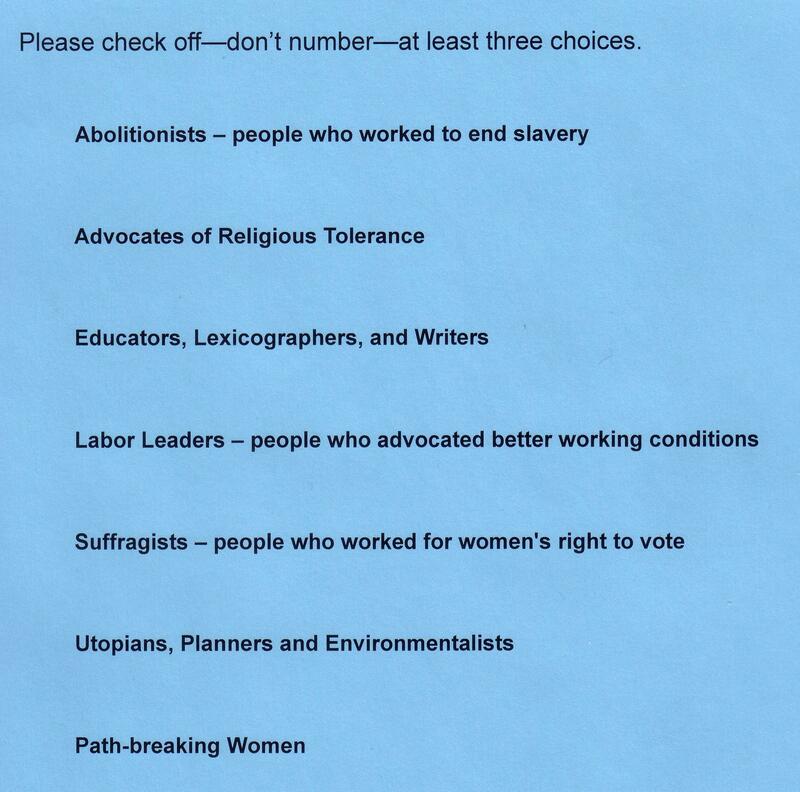 How did the various movements for greater democracy intersect, in the life of a figure such as Abby Kelley Foster? When Frederick Law Olmsted advocated public parks, who needed them most? To help students identify with their assigned historical figures, our amazing integrated arts teacher, Emily Miller Mlcak, guided them through the process of painting portraits, using as their sources photographs, drawings or paintings from the time, or portrayals of similar people if we had nothing else. 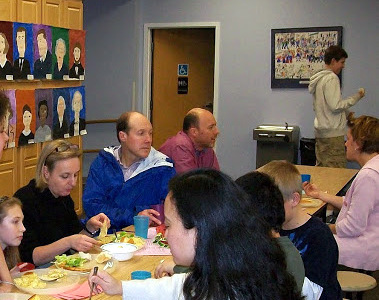 In the photograph below, of students relaxing and eating with their families after the presentations, you can see some of that year’s portraits on the closet doors at the left. One year, I followed a sudden inspiration and asked kids to think and write about their historical figures as animals. One girl, who had struggled with Mum Bett’s conventional unattractiveness in the only available source portrait, wrote a breathtaking piece about Mum Bett as an owl–for wisdom, but also for flying to freedom. In all the ways we supported kids for the challenge of even very brief public speaking, nothing was more important than the support they gave each other. Student partners helped each other write functional note cards that could be glanced at quickly; they rehearsed together; on the night of the potluck, they stood up together, silently reinforcing each other. The audience of parents also played tremendously important roles, making it a point to chat, after the presentations, with all the children, focusing on the content they had learned, not just the performance. It helped that those parents, and the rest of the class, would typically have only a slight acquaintance with the information being presented. That boosted kids’ confidence, and also gave them a real sense of responsibility and mission. Some kids wanted to speak as their people, in the first person. Others wanted to speak about their people, in the third person. I couldn’t see any reason not to just give them the choice. Either way, the past of that person became a part of their present, and their audience’s. My memories of how all this worked are very vivid and personal. I think of one of my youngest students, pretty much terrified to stand up, looking at his partner and moving forward. I think of girls absorbing, for the first time, the idea that their grandmothers or great-grandmothers were blocked from getting the kinds of education they wanted. 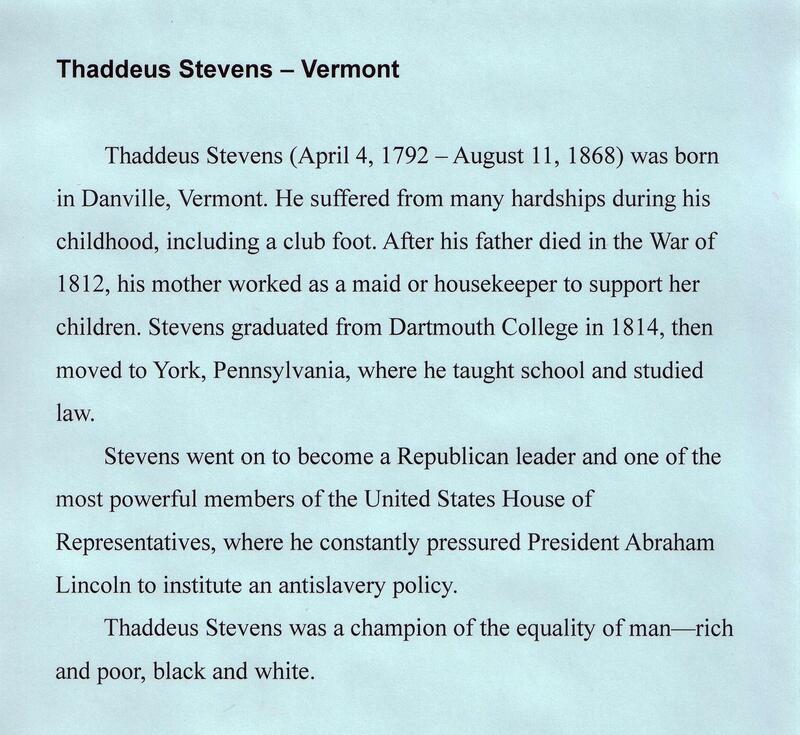 I think of Josh, explaining to me the reasoning Thaddeus Stephens used to convince fellow congressional representatives, and Lincoln, that continued slavery would cause the north to lose the war. I think of these people called into the present to be a part of our community in some way. Ifeanyi Menkiti, Nigerian Ibo poet and Wellesley College philosophy professor, once explained to me how, among some African tribal cultures, the circle of minds invited to the deliberations of the community includes past and departed members of the community, as long as people still sense their presence–a concept of immortality astonishingly pragmatic, true to our almost universal human experience of felt presence. Thinking this through over the past week, I’ve thought how, at the other end of our timeline, some Native American Indian cultures have committed themselves to considering the needs of generations to come, not just the grandchildren they might hold and know as inspiration, but many generations beyond, unknowable. Again pragmatic; again, a function of the imagination in public life. One way or another, we live in our highest purposes, and serve them most truly, whenever we reach to broaden what we mean when we say “us.” And that seems to be true at any age. This entry was posted in Class life, History, Integrating the arts, Reading and writing and tagged African-American history, biography projects, Emily Miller Mlcak, Ifeanyi Menkiti, individual oral presentations, labor history, Mary Brochu, natural history of New England, New England history, painting historical portraits, partnering support for oral presentations, women's rights by pollybrown2013. Bookmark the permalink.